Nav System, Moonroof, Heated Seats, Back-Up Camera, Rear Air, LIVE COCKPIT PRO, HEATED FRONT SEATS, PARK DISTANCE CONTROL, Turbo Charged Engine, Aluminum Wheels, CONVENIENCE PACKAGE. FUEL EFFICIENT 36 MPG Hwy/26 MPG City! Glacier Silver Metallic exterior and Canberra Beige SensaTec interior, 330i trim. Warranty 4 yrs/50k Miles - Drivetrain Warranty; SEE MORE! Rear Air, Back-Up Camera, Turbocharged. Sunroof, Child Safety Locks, Steering Wheel Controls, Heated Mirrors, Electronic Stability Control, Bucket Seats, Electrochromic rearview mirror. CONVENIENCE PACKAGE Active Driving Assistant, cross-traffic alert rear, For vehicles equipped w/navigation, speed limit info is additionally included, Active Blind Spot Detection, LED Headlights w/Cornering Lights, SiriusXM Satellite Radio, 1 year All Access subscription, Comfort Access Keyless Entry, Lumbar Support, LIVE COCKPIT PRO navi, Apple CarPlay Compatibility, 1 year trial, Connected Package Pro, HEATED FRONT SEATS, PARK DISTANCE CONTROL. 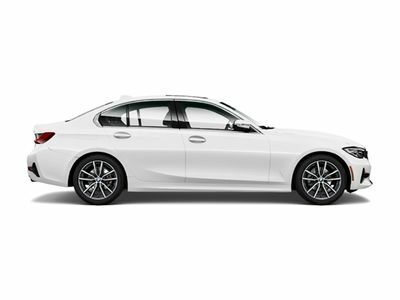 BMW 330i with Glacier Silver Metallic exterior and Canberra Beige SensaTec interior features a 4 Cylinder Engine with 255 HP at 5000 RPM*. Lane Keeping Assist, Blind Spot Monitor, Brake Assist, 4-Wheel ABS, 4-Wheel Disc Brakes, Tire Pressure Monitoring System United BMW Promise United BMW is proud to be the #1 volume BMW dealer in the Nation as well as the largest retailer in Penske Automotive Group. BMW of North America has awarded United BMW with it's SIXTH consecutive Center of Excellence Award! United BMW is the only BMW dealership in Georgia to win this prestigious award!